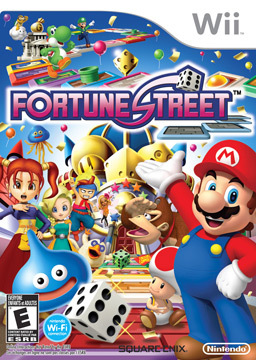 When Fortune Street hit shelves, many people were expecting another Mario Party style romp but with an emphasis on earning money instead of stars. But this is NOT an entry in the Mario Party series whatsoever. Fortune Street is the U.S. version of the Japanese series "Itadaki Street" which has been around since the days of the original Famicom. The concept is simple: buy properties and stock, invest, gain promotions, and head to the bank when you have enough assets to win. Gameplay can be challenging and surprisingly deep, however. Standard mode is another animal entirely and very stimulating to gamers who like a good mix of strategy and luck. Shops are divided into districts. Each district has its own distribution of stocks which can make the block very lucrative if everyone purchases stock in it, but you can just as easily sink an opponent who has dominant, high investments in a district by selling all of your stocks in that particular district. But selling your stocks in a given district can also prevent you from reaping the benefits of lucrative dividends. If this were an analog board game, it would be nearly impossible to keep up with all cash and asset changes but luckily each player has a running total of cash on hand and total assets in the bottom corner. You can also receive a cash bonus for selecting multiple Venture Cards in a row (but watch out for Waluigi who will select Venture Cards randomly and block your bonus). Players can also buy out properties from opponents for a hefty some, and CPUs will definitely frustrate human players by doing so depending on their assigned difficulty levels. Levels range from "D" (very tame) to "A" (very smart and lucky players) to "S", a designation only for certain very smart characters that you'll have to unlock. The board designs could use a bit more scenery, but the layouts are excellent representations of the Mario and Dragon Quest franchises. You'll find classic destinations like SNES Mario Circuit and Castle Trodain as playable boards. Plus, six more challenging boards can be unlocked. Unlocking characters requires completing portions of the single player campaign, which isn't easy. However, if you find yourself at a critical dice roll in the game, you can use the "out to lunch" function and let the CPU roll for you. You can buy personality traits for your Mii CPU that increase their probability of high rolls and essentially let the computer do a lot of the dirty work for you if you don't have time to defeat the campaign on your own. The music is a pretty typical recycling of Mario and Dragon Quest themes, but it becomes very old after awhile. 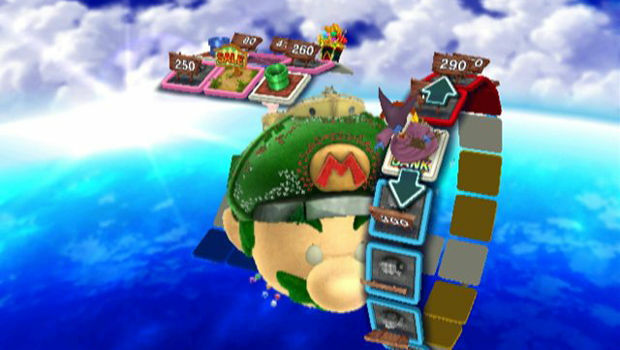 There are a few mini-games embedded into each round, but they don't naturally occur after each turn like they do in Mario Party. The games are chance-based and involve slots, dart boards, randomly selecting "?" blocks, and even placing bets on different colored Slimes like a horse race. They have very little bearing on the outcome of the game but are pretty fun. The characters have text dialogue before they roll, but it's extremely time consuming. Trust me, the best way to enjoy a game is to go into the options and turn the dice roll and text speeds all the way up to 5 and turn the chat off. It will literally cut the time to play a board in half. The real gripe I have about the game is during certain turns, a CPU opponent will do something peculiar like move in a direction that doesn't seem advantageous for them, then the next turn they'll draw a venture card that makes their peculiar move seem like a very smart choice. It hardly seems random, and probably wouldn't work out the same way for you if you tried. Overall, if you're looking for a casual and fun (but not mind-numbing) game to play with friends, Fortune Street's Easy mode can be hours of entertainment. Standard Mode, however, can be a brutal and competitive affair if you take away the cutesy characters and music and see the game for what it is.